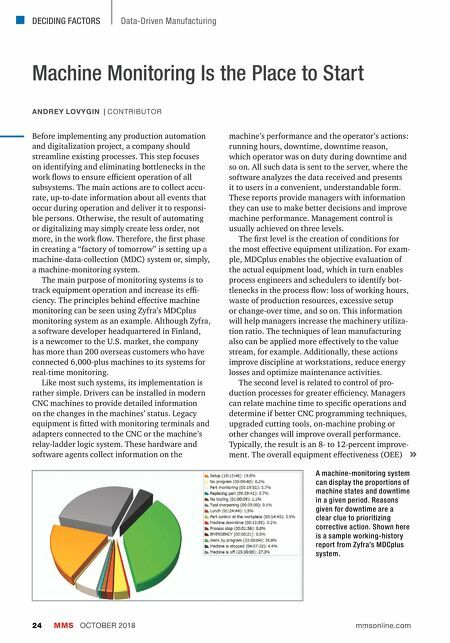 DECIDING FACTORS MMS OCTOBER 2018 24 mmsonline.com Data-Driven Manufacturing Machine Monitoring Is the Place to Start ANDREY LOVYGIN | CONTRIBUTOR Before implementing any production automation and digitalization project, a company should streamline existing processes. This step focuses on identifying and eliminating bottlenecks in the work flows to ensure ecient operation of all subsystems. The main actions are to collect accu- rate, up-to-date information about all events that occur during operation and deliver it to responsi- ble persons. Otherwise, the result of automating or digitalizing may simply create less order, not more, in the work flow. Therefore, the first phase in creating a "factory of tomorrow" is setting up a machine-data-collection (MDC) system or, simply, a machine-monitoring system. The main purpose of monitoring systems is to track equipment operation and increase its e- ciency. The principles behind e…ective machine monitoring can be seen using Zyfra's MDCplus monitoring system as an example. Although Zyfra, a software developer headquartered in Finland, is a newcomer to the U.S. market, the company has more than 200 overseas customers who have connected 6,000-plus machines to its systems for real-time monitoring. Like most such systems, its implementation is rather simple. 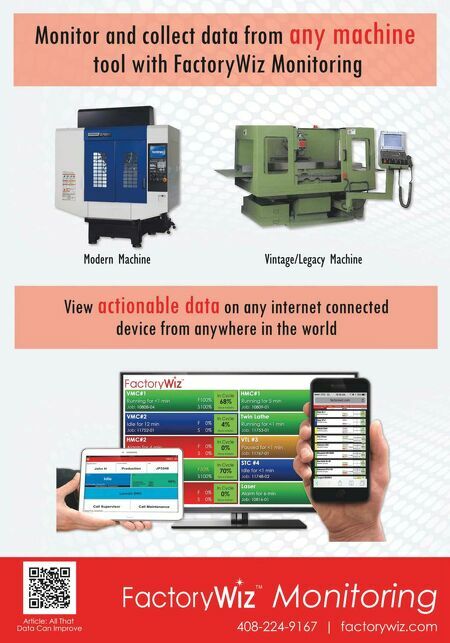 Drivers can be installed in modern CNC machines to provide detailed information on the changes in the machines' status. Legacy equipment is fitted with monitoring terminals and adapters connected to the CNC or the machine's relay-ladder logic system. These hardware and software agents collect information on the machine's performance and the operator's actions: running hours, downtime, downtime reason, which operator was on duty during downtime and so on. All such data is sent to the server, where the software analyzes the data received and presents it to users in a convenient, understandable form. These reports provide managers with information they can use to make better decisions and improve machine performance. Management control is usually achieved on three levels. The first level is the creation of conditions for the most e…ective equipment utilization. For exam- ple, MDCplus enables the objective evaluation of the actual equipment load, which in turn enables process engineers and schedulers to identify bot- tlenecks in the process flow: loss of working hours, waste of production resources, excessive setup or change-over time, and so on. This information will help managers increase the machinery utiliza- tion ratio. The techniques of lean manufacturing also can be applied more e…ectively to the value stream, for example. Additionally, these actions improve discipline at workstations, reduce energy losses and optimize maintenance activities. The second level is related to control of pro- duction processes for greater eciency. Managers can relate machine time to specific operations and determine if better CNC programming techniques, upgraded cutting tools, on-machine probing or other changes will improve overall performance. Typically, the result is an 8- to 12-percent improve- ment. The overall equipment e…ectiveness (OEE) A machine-monitoring system can display the proportions of machine states and downtime in a given period. Reasons given for downtime are a clear clue to prioritizing corrective action. Shown here is a sample working-history report from Zyfra's MDCplus system.